Adolescence can be a difficult time. With all the pressures teens face, including pressures at home, school and social settings, it’s no surprise that many teenagers and young adults suffer from depression. Due to changing hormones and other factors, most teens experience mood swings and emotional highs and lows; however, some young adults suffer from symptoms that affect every aspect of their lives. Much like adult depression, adolescent depression can cause many unpleasant symptoms, including overwhelming sadness, changes in sleep and eating patterns, loss of interest, trouble concentrating, feelings of low self-worth and physical aches and pains. The causes of teenage depression are hard to pinpoint. Much like adult depression, the symptoms of teen depression can be caused by a number of factors. For many teens and young adults, causes include problems at home or school, low self-esteem, substance abuse and biological or psychological factors. In adults, depression is usually treated with antidepressants; however, antidepressants have been shown to cause several negative, and even dangerous, side-effects in some children and young adults. Some of these side-effects include worsening of depression symptoms and increased risk of suicidal thoughts or actions. This risk is at its highest during the first few weeks of taking antidepressants, or shortly after a dosage is changed. Because of these risks, many parents and mental health professionals prefer other treatment methods over medications. The following is a list of fifteen things teens can do to alleviate their symptoms of depression. Depression has a major impact on the ability to participate in social activities. However, a lack of social support can intensify symptoms, which makes staying social a major part of treatment and recovery. Joining groups or teams at school is a good way to stay social and busy, as well as boost self-esteem. Writing down thoughts and feelings is a great way to better understand your depression. By keeping a record of your symptoms, you can learn to recognize the factors that trigger depression, and can then take measures to avoid or properly handle those triggers. Blogs are another great way for young adults to record their thoughts. Unlike a traditional diary or journal, blogs offer support and inspiration in the form of online friends and fellow bloggers. Regular workouts can work wonders for mild to moderate depression. Exercise boosts the production of endorphins in the brain. These “feel good” chemicals enhance mood, increase energy levels and can lead to improved self-esteem and better overall health. Changes in appetite are a common symptom of depression; while some individuals may overeat when depressed, others may not eat at all. These changes can directly affect mood and energy levels, and can exacerbate other symptoms of depression as well. Although teen/parent relationships can be strained at times, most parents want to protect their children and keep them safe and happy. While it may be hard for teens to open up to their parents, doing so can help lift some of the burden of depression. Most schools have counselors whose jobs are to help students with problems. Counselors can offer and advice and recommend methods of treatment. Expressing yourself through art can be a great way to treat depression by improving self-esteem and occupying the mind. Creativity can take many forms, but can include drawing, painting, playing an instrument, singing, writing and dancing. For teens suffering from depression, close friends can be an enormous source of support. Friends are likely to be nonjudgmental, and to listen and give advice. When things get too tough to handle, reach out for help by calling a depression hotline. The Boys Town hotline is specifically geared to teenagers. There are numerous online resources for teens suffering from depression. These online communities are similar to a support group, but have the added benefit of complete anonymity. Remaining anonymous can help young adults speak freely about their symptoms, fears, thoughts and feelings. This openness and honesty can help get to the root of an individual’s depression, and help them overcome their negative feelings. Sedentary lifestyles are becoming more and more common, especially among children and teens. This inactivity can only intensify symptoms of depression. Staying busy will help keep the mind occupied, which can leave less time for dwelling on negative thoughts. Even individuals with depression have activities they enjoy. Making the time to do things that make you laugh or smile can mean all the difference in having a good day and a bad day. For many teens, seeing past their current situation can be difficult. However, thinking positively about the future is a great way to curb symptoms of depression, as well as set the foundation for a happy future. One good example of planning for the future is deciding on a college or career path, then taking steps to achieve those goals. Nothing lasts forever, and that includes depression. While it can be hard to understand it now, most teens who suffer from depression go on to live full and happy lives. No matter the problems one may suffer during their teen years, such as parents divorcing, a death, or a bad relationship, it can and will get better. 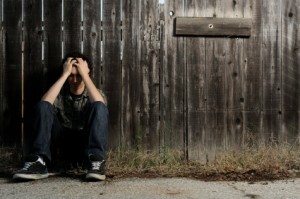 Feelings of guilt and shame are often associated with depression. The important thing to remember is that depression is a real condition, and it’s not your fault. When some of the guilt is lifted, the real process of healing can begin. There are several warning signs of teenage depression parents and friends can look for if they suspect a teen is suffering from depression. These include a tendency to spend most of their time alone, changes in eating and sleeping patterns, reckless behaviors, changes in attitude, bouts of anger and/or sadness, loss of interest in friends and social activities, suspected drug or alcohol use, threats of suicide or self-harm, and frequent joking or romanticizing about death or dying. If warning signs present themselves or have been evident for some time, it’s important to approach the depressed individual and try to get them to get help. Although antidepressants carry dangerous risks for teens and young adults, there are other treatment options available, including counseling and group therapy. If left untreated, symptoms of depression can worsen considerably. In some cases, failure to get the proper help can result in suicide, self-harm or violence against others. If you are a teen suffering from depression know that help is available. You can get better. No matter what is going on in your life it is possible to feel happy again. Just reach out for help and keep reaching out until your needs are met.